Raoul Cita, a lifelong member of the doo-wop group The Harptones, died on Saturday after battling stomach and liver cancer. He was 86. Cita was a pianist and arranger who brought together members of two New York area vocal groups, the Skylarks and the Winfield Brothers, to form the Harptones. 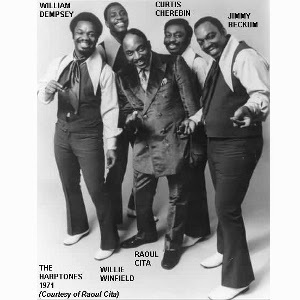 The original group was a sextet comprised of Willie Winfield, Billy Brown, Claudle "Nicky" Clark, William Dempsey, William "Dicey" Galloway and Cita who occasionally contributed tenor and baritone vocals. Their first success came at the Apollo Theater in November 1953 while they were still known as the Harps. The group won first place in the talent contest with their performance of Louis Prima's A Sunday Kind of Love. A record label rep heard them perform and asked that they visit his office but, while they were waiting for their appointment, they were overheard singing by people from Bruce Records who rushed the group into the studio to record A Sunday Kind of Love and I'll Never Tell. The company also changed the group's name to the Harptones to avoid confusion with the gospel group The Harps. The record became popular on a local level around the east coast but didn't chart nationally. Years later, it would be recognized as one of the greatest of all doo-wop recordings but, in its day, poor distribution kept it from becoming a hit. Ironically, the Harptones are considered one of the greatest of all doo-wop groups, but they never charted on the R&B charts and only reached the Hot 100 once, in 1961, when they peaked at number 96. Nevertheless, they continued to record sides for Bruce and, later, for Old Town, Andrea, Rama and other labels, and were very popular as a concert act including for Alan Freed's shows. In 1956, Cita formed the Royale Cita Chorus with members of the Harptones, the Joytones and the Lyrics. The ten-strong group was used to backup other singers such as Mabel King and even the Harptones themselves on their song That's the Way It Goes. In early 1957, Harptones member Billy Brown died of a drug overdose. Cita left the group shortly after, choosing to record as a duo with Gloria Hawkins as Roy and Gloria. Over the next few years, Raoul would do work for a number of groups, including a few arrangements for the Harptones, but didn't return to the fold until 1964. The new configuration of the Harptones recorded a couple of sides but, with the exit of Willie Winfield, the band fell apart. Willie and Raoul reformed in the early-70's with new group members and, in 1982, recorded the album Love Needs for Ambient Sound. In 1983, they backed up Paul Simon on the track Rene and Georgette Margritte With Their Dog After the War for the singer's Hearts and Bones album. Cita kept the Harptones together over the years and was still performing with Winfield, William "Dempsey" James, Vicki Burgess and Dun Cruz.